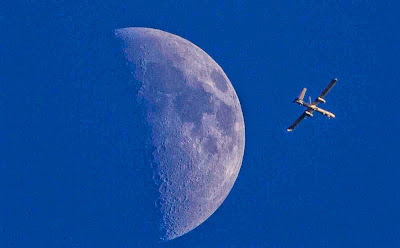 DONETSK, Ukraine -- The first unarmed drones have arrived in Ukraine to help OSCE teams monitor the implementation of a fragile one-month truce in the separatist east, the pan-European security group said. The Organisation for Security and Co-operation in Europe will deploy four unmanned aerial vehicles along Ukraine's border with Russia and in the war zone as part of a peace deal agreed by Moscow and Kiev on September 5, OSCE spokesman Michael Bociurkiw said. He said the vehicles were still clearing customs and would only be deployed once they are reinforced by teams of civilian experts who operate them from the ground. French Defence Minister Jean-Yves Le Drian said that France and Germany also intend to send drones to Ukraine in the coming days. Bociurkiw said it was still unclear if those unmanned surveillance vehicles would be part of the OSCE mission or flying separately. "Negotiations (on the subject) are ongoing at a very high level," he said by telephone. He added that the OSCE intended to double the size of its monitoring mission in east Ukraine from 80 to 160 personnel. Its entire team in the war-torn former Soviet country would also grow from 250 to 500 staff members. "We will remain an unarmed civilian mission," Bociurkiw said. The September 5 agreement, also signed by two separatist leaders, calls for an immediate ceasefire and negotiations about the Russian-speaking region's future status within Ukraine. It was reinforced by a September 19 deal for the rivals to set up a 30 km (19 mi) buffer zone along the front line and to pull back their heaviest guns from eastern villages and towns. Ukraine's parliament separately approved President Petro Poroshenko's proposal for the rebel-held region to enjoy three years of limited autonomy while political negotiations continue.